Don’t forget to clean the hidden spaces! A completely clean kitchen includes the areas that you cant see! The saying goes that the kitchen is the heart and soul of every home, and the same applies for a catering or food service business. Without a large, capable and commercial grade kitchen, no business in the food trade can be viable. With this in mind, it’s incredibly important to keep this living, breathing and hard working asset in tiptop working order and sparkling clean! In this blog we explain what a complete kitchen clean involves and highlight some of those hidden spaces you might have missed. A commercial kitchen is a hive of activity and over the course of just one day can feed anywhere up to hundreds, and on some occasions, thousands of people. As such it is important that it is keep clean, tidy, sanitised and in order. Throughout the day, and then most importantly at the close of business, staff will be tasked to clean the kitchen. Procedures and checklists are routinely put in place to make sure this is undertaken properly and thoroughly. 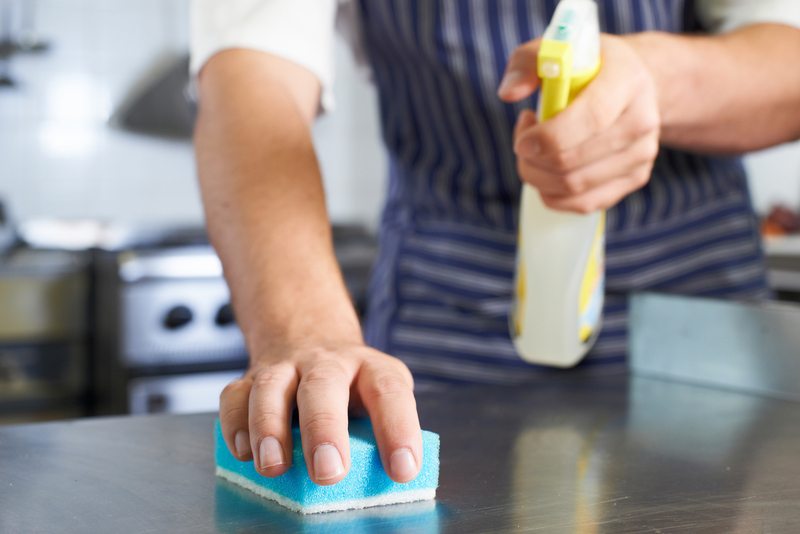 These practices ensure a clean, sanitised and organised kitchen that is ready for business the next day. A full kitchen and canopy clean will result in a cleaner working environment, reduced fire and safety hazards and better working efficiency of the kitchen. It will also ensure that it meets its workplace standards and comply with insurance demands if ever necessary. The above will ensure that the kitchen looks clean and on first inspection and it certainly will sparkle. However, it is just as important to clean and sanitise those areas that are not so obvious. By this we mean the insides of the kitchen equipment! Ice machines ensure that your customers are able to enjoy ice filled beverages and other things on demand. The customer directly consumes the ice made by these machines, and while ice-cold conditions seem unlikely to be unclean or spread disease, if not kept clean, that is exactly what they do! Without regular and thorough cleaning, ice machines can cause the spread of nasty germs like Salmonella, Listeria, E. coli and others. To properly clean an ice machine it is important that all the panels are removed to allow access to the evaporator and that this part of the machine is de-scaled, cleaned and sanitised. Following this the water tank must be flushed clean and sanitised. The ice bin, walls and seals must also be cleaned and sanitised and as a final step, and after re-assembling the machine, the water tank should be pH tested for safe levels. The most amazing invention of convenience this century, dishwashers are responsible for keeping the customer facing equipment like plates, utensils and glasses sparkling clean. As well as these items, so much more cooking and back of house equipment and utensils regularly travel through these wonderful machines! With so much dirt going in, it’s reasonable to think that they themselves need a good solid clean regularly! Dishwashers must be serviced to make sure that the temperatures reached are hot enough, that hard water has not resulted in mineral deposits placing strain in the machines cleaning ability and efficiency, and that its interior panels are dissembled, cleaned and sanitised. This is where things get hot! Keeping a handle on a clean oven is important so cleaning regularity here is paramount. It is important to employ the use of commercial grade oven cleaning chemicals to remove hardened spills and fats, grease and grime. Oven doors, shelves, exhaust fans and trays must also be treated as an extension of the oven itself and cleaned to the same standard. Oven door seals must be cleaned, sanitised and checked for effectiveness to ensure that the right temperatures are being reached and the oven is operating efficiently. An incredibly important asset in every working kitchens day-to-day activities, fridges and freezers are used to store food and reduce spoilage. Without proper management they can become a dumping ground and viable breeding area for germs and bacteria! To perform at their best and remain hygienic it is important that they are kept at temperatures below 5 degrees Celsius and are regularly emptied, cleaned and sanitised. All door seals should also be checked and cleaned, and the effectiveness of the fan unit checked to gauge airflow and temperature control is maintained. In conclusion, a commercial kitchen is made up of many different spaces, some that are immediately visible and others that are behind closed doors. All must be kept clean and hygienic for the whole to work as a risk free and efficient centre of the business operations. Jaymak Australia is a national company that provides a professional and accredited service in the field of commercial hygiene equipment services. With extensive experience in coolroom and mould remediation, they also specialise in a range of other services including full commercial kitchen cleaning. A full kitchen and canopy clean by Jaymak will result in a cleaner work environment, reduced fire and safety hazards, better efficiency and ensure your business meets Australian standards and compliance with insurance. Please do not hesitate to contact one of their expert technicians who will be able to answer any questions you may have and provide an obligation free quote on 1300 529 625 or read about their products and services at www.jaymak.com. The importance of keeping ice machines clean – the cold hard facts!